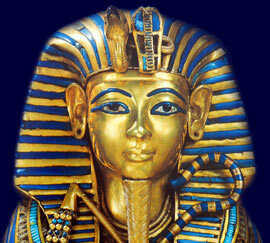 The Ancient Egyptian government was headed and dominated by the Pharaoh. His was the ultimate and greatest power. The 'right hand man' of the Pharaoh was the Vizier (equivalent to a Prime Minister). Court officials and nobles held high office in Ancient Egypt and these, together with the Pharaoh and the vizier, governed the country. The central ancient Egyptian government was responsible for legislation and the administration of certain functions on a national basis, but delegated some responsibilities to local, or provincial administration. The definition of a government is described as institutions and officials which enact laws and enforce public programs thereby exercising overall control and direction of a country. The government sector is usually broken down into central government and local government as was the Ancient Egyptian government. The land of Ancient Egypt originally consisted of two halves, which were called Upper and Lower Egypt. Upper Egypt was the valley area in the South and Lower Egypt was the delta area in the North. Upper and Lower Egypt each had their own government and rulers. Upper Egypt was divided into 22 districts. Lower Egypt was divided into 20 districts. Upper and Lower Egypt were eventually united in 3118BC. The framework of the earlier Ancient Egyptian government were the districts, each of the districts had a nomarch, or governor, who was the chief of the provincial administration. The provinces, or districts, were called nomes and the governor, or head, of the provincial administration was called a nomarch.